A spike in costs of key ingredients, together with bearish LME (London Metal Exchange) prices, threatens to cut margins of domestic aluminium makers in the near term. LME aluminium prices have been tanking for over four weeks, falling to $1,775 a tonne as on January 14 after scaling a seven-year-high of $2,718 in April 2018. The price trend is disquieting for the three primary producers — National Aluminium Company (Nalco), Vedanta Ltd, and Hindalco Industries Ltd — whose smelting costs are still hovering around $2,000 a tonne. "The cost of production of smelters with own alumina will still be below $2,000, but it will affect the profitability. Other than input prices coming down, we do not see any other avenues for cost reduction. At these prices, at least 50 per cent of smelters globally will be making losses, so we expect either prices to pick up or some capacity shutdown to happen," said an official of a large producer. Due to input commodity inflation, aluminium companies are on a tightrope walk to contain their metal production costs. Between April and October last year, coal costs for the non-regulated sector- primarily aluminium and cement rose by 20 to 34 per cent. To magnify their woes, aluminium producers are facing recurring coal shortages as the dry fuel is increasingly diverted to meet the requirement of the power sector. Coal scarcity at home has enhanced dependence on imported thermal coal. Moreover, the threat from imports is worsening with the simmering US-China trade war. "The ongoing trade war between the US and China and the consequent tariff sanctions by the US on Chinese imports have resulted in virtual blockade of Chinese imports into the US. Due to this, China would be looking for alternate emerging markets for its produce and India will be most vulnerable to this -- especially in the downstream segment. Indian downstream manufacturers are already at a disadvantage vis-à-vis the metal (raw material) prices -- LME vs the Chinese SHFE (Shanghai Futures Exchange) prices. 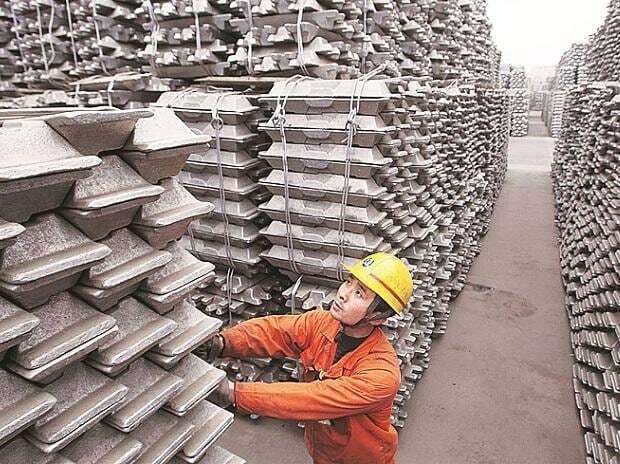 China's SHFE has typically been lagging LME by over $300 per tonne or lower in FY19 and this is expected to get worse in FY20 if the government doesn't take any preventive measures like import duty raise, safeguard or anti-dumping duty," the official said. As per data compiled by the Directorate General of Commercial Intelligence and Statistics (DGCIS), Chinese aluminium imports into India have surged 62 per cent year-on-year (y-o-y) from April to November in this fiscal. Uptrend in imports is also seen in case of scrap imports from US and value-added products of South East Asia nations tied by Free Trade Agreements (FTAs) with India. Imports are making fast gains into the market share of domestic aluminium players. The share of imports to the total domestic aluminium consumption in the country has reached a staggering 60 per cent, forcing the domestic manufacturers to either widen their export markets or expand production of downstream products, especially the ones that can act as import substitutes.